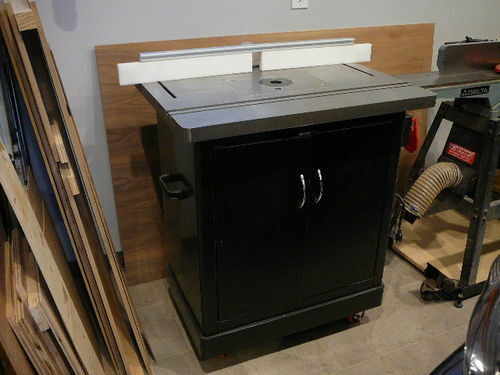 It’s been a year since I ordered the Bench Dog Promax RT Cast Iron router table, Pro Fence, ProLift, and steel cabinet. Rather than review on each component I decided to review the entire set up since the Bench Dog sells it as a complete set up. The complete set up is $1000 on Rockler. First off – this thing is a beast. The table top weighs in at 100 lbs and the router lift with my 3-1/4 HP Porter Cable Router weighs 35 lbs or more. The cabinet weighs 40 lbs or more. During assembly I lost control of it while laying the assembled cabinet on its side and spent 2 days flat on my back with a pulled hamstring that wound up bruising my knee and thigh area. Make sure you have an extra set of hands when setting this up since it is so top heavy. The base cabinet came pre-assembled. I chose to buy heavier rollers so I built some shims to mount them on. The table mounted to the cabinet with no problems. Similarly, inserting the router motor into the lift was relatively easy and the instructions were through with plenty of pictures. Leveling the router plate took some time and was a chore since it had to be done with the router motor installed. 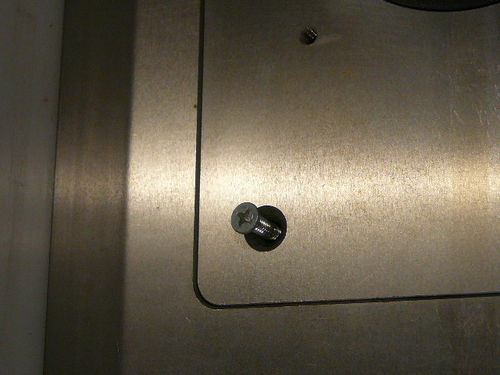 The router plate is screwed to the table with a couple of heavy duty screws. 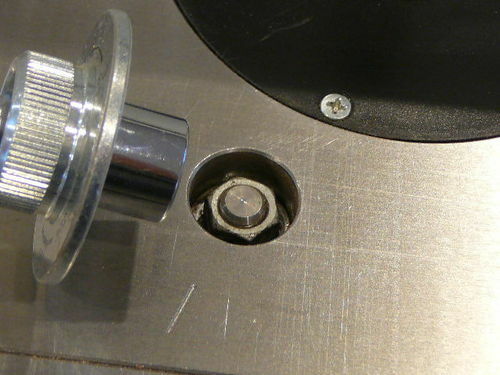 The router motor sits inside a separate enclosure inside the cabinet that has a 4” dust collection port on the back and a sealable opening for the power cord. That allows the router cord to be pulled out of the inner enclosure so it won’t be in the way of dust removal. 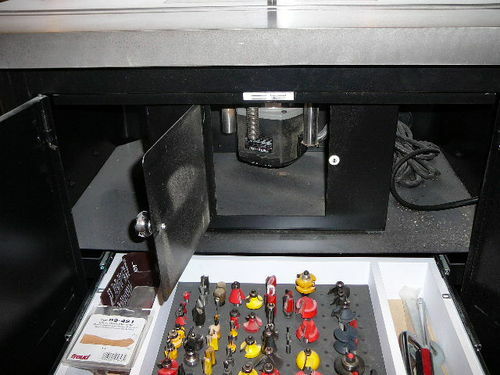 There is a large drawer with a foam insert to hold router bits and miscellaneous small parts. Below the drawer is more storage for larger items. The magnetic catches on the doors do not work well so they continually pop open. 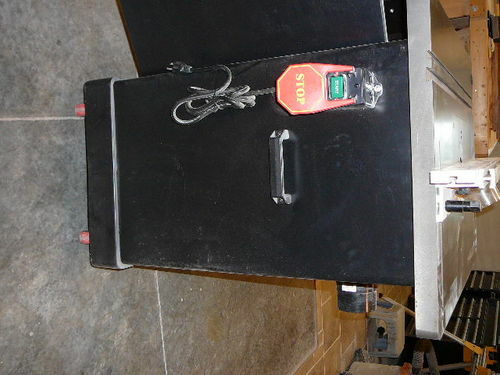 A large paddle style start/stop button is mounted on the side of the cabinet with a 6’ power cord. Inside the cabinet, the cord from the router plugs into the start/stop button. The fence mounts to the table top using a couple of lag bolts and some washers inserted into the fence. The fence is aluminum with ribs on the bottom. Unfortunately, the aluminum does score the cast iron when the fence is slid around. I tried using UHMW tape on the bottom but the tape didn’t stick well. I also cut a 1/8” piece of UHMW plastic and put it underneath the fence. That also did not work out. The original fence came with CHEAP MDF fence board that had already started to mushroom out on the corners. 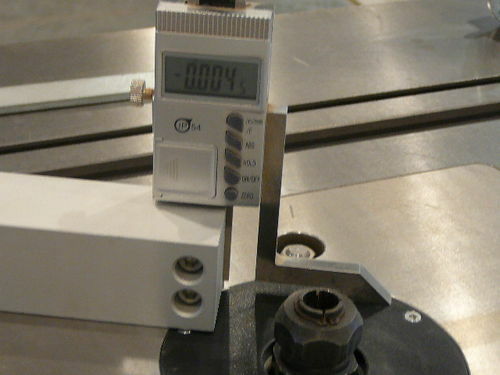 I replaced them with some 3/4” UHMW panels. This is one of the reasons for my rating. At this price point and with the heavy duty nature of the cast iron components, a flimsy, CHEAP, fence board sticks out as poor quality. I also have issue with the design of the fence slots in the table. Keeping the fence square with the miter slot when making minute adjustments to dial in the fence is impossible. I contacted Woodpeckers and Incra about their micro adjustment fence systems. Both of them replied that the Bench Dog table will not work with their systems. Again, a little more thought on how to accommodate after market add-ons like these would be helpful. As it stands now, any time I have to use the miter bar to router pieces, fine tuning the fence takes a long time. 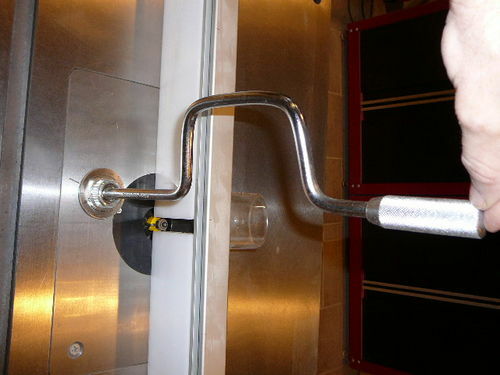 The router lift is operated using a handle to raise/lower the router. 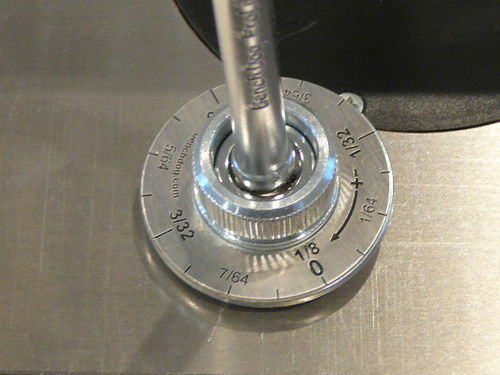 The handle is inserted into a collar that fits over a hex head inset in the plate. 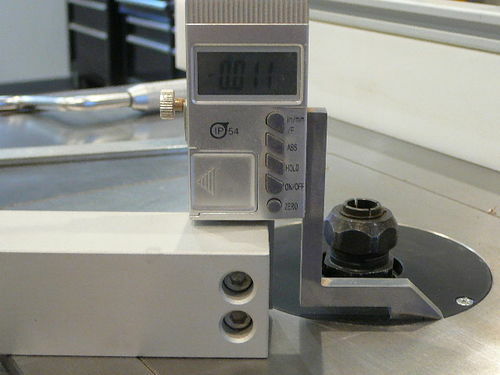 The collar has markings for 1/28” and a feature that allows it to be zeroed out so any up/down adjustments can be precisely made using the scale on the collar. I really appreciate the thought that went into the design on this component. Unfortunately, the plastic insert plate is a disaster. First of all, it is held in place with 3 small screws. The first time I took the insert off during the initial set up one of the screws got knocked into the top of the router motor and I had to take everything apart and shake it out of the motor. I immediately e-mailed Bench Dog about that problem since it has the potential to turn out badly. One of the engineers replied that they had not thought about that and it would be forwarded to the appropriate folks. The plastic inserts are also thin and flimsy. They flex and bow between the screws and they sit below the edge of the opening. The solution proposed by Bench dog was to use tape to shim up the plastic insert until it was flush with the table top. I’ve looked all over the internet for a better insert. 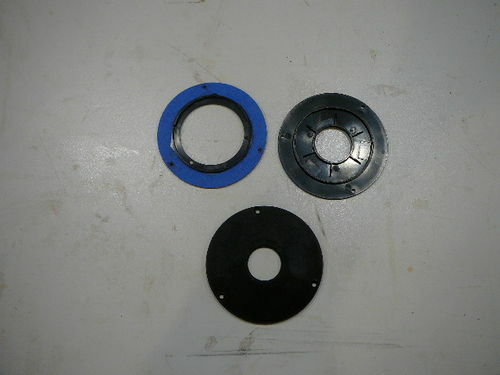 Apparently, Bench Dog used to have anodized aluminum inserts until Rockler bought them out and decided these cheap plastic inserts were better. Does anyone have ideas on how to remedy this? I thought about making wood inserts but I’m not sure it would be thick enough to keep from bowing. Getting the lower wrench onto the collet is also a problem since the router lift does not allow the motor to come up high enough. The cabinet doors not staying closed during operation, the fence configuration, the appalling lack of quality of the inserts, and the collet accessibility are all problems that have to be dealt with every time I use the router table. 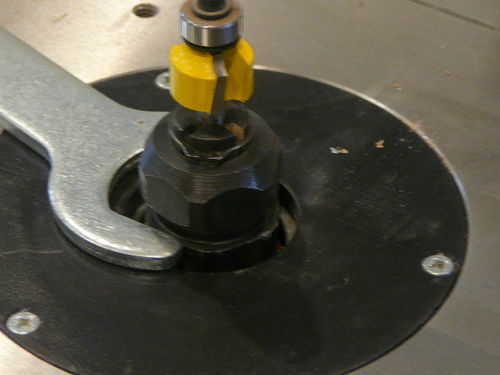 These problems on a $1000 piece of equipment offset the heavy duty table, router lift, and plate which is why I give the bench Dog Promax complete router table 3 Stars – for inconsistent quality. They don’t have to be anything fancy. align the fence so it is dead straight end to end. make 2 matching sicks with blocks that fit in the slot. Put the blocks in the slot at the ends of the table. the fence is then moved to the end of the sticks and the fence is now parallel to the slot. I’m following your train of thought. Multi-track for the sticks and a miter bar might be the way to go for something more permanent. 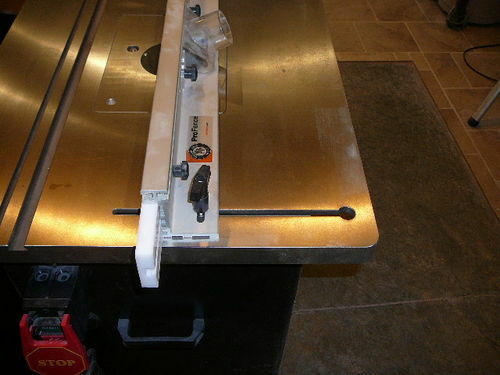 I have the extension wing version for my Delta table saw. After looking at the options, I decided on a JessEm master lift. The complaints you have about the lift don’t apply to it. 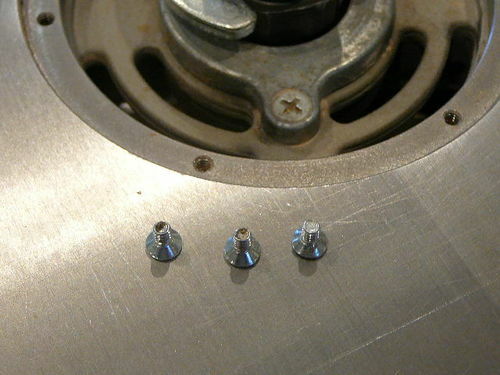 The leveling screws are accessible from above, and the inserts are pretty stable and cam in place, rather than using screws. One thing I don’t follow is your need to have the fence parallel to the miter slot. I use a coping sled or a miter gauge depending on the need for things like cope cuts, and use the fence flush with the bearing bit for profile cuts. The only time I use the fence with the miter gauge or coping sled is when I’m using it as a stop block to register the wood against for depth of cut. i agree with your inconsistency with bench dog. i have the older router cabinet from them and although it has held up, there is a large room for improvements(door stops). i am glad i went with a jessem lift after reading about your experience with the inserts…but to be fair, i seldom see router inserts sit flush. but, i do like the cheap mdf fence faces…use them as sacrificial. i’ve replaced mine several times and each time with mdf; it’s cheap and straight. I agree with Rich Taylor about needing the fence to be parallel to the miter slot. In fact, some fence designs, esp. on homemade router tables, pivot one end of the fence and move the other end to make the adjustment with the bit. The reason for this is it makes very fine adjustments easier to do. Aluminum scratching cast iron? That’s a new one on me. Anyhow, a few minute scratches on cast iron have no affect on the performance of the router table. Oxidized aluminum is aluminum oxide aka sandpaper grit ! Yes it will scratch a lot of things. I have a BD wing table attached to my table saw, for 3 years it was equipped with a Rockler lift which uses the same inserts you have. I had to use shims to level mine as well – a bit of work but once done it works fine. The screws are a PITA and I wound up keeping a Yankee screwdriver equipped with a magnetized phillips bit attached at hand. This made insert changes faster and I stopped dropping screws. That said, I finally tired of the whole thing and purchased a Jessum/Incra lift with the magnetic inserts. This is nice as changes are quicker and there are more opening sizes to choose from but the inserts sit a couple of thousands too high. 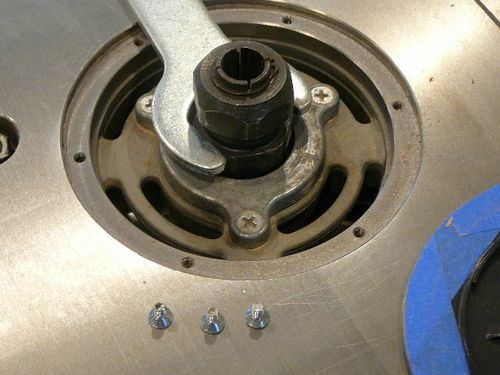 Too high is worse than too low as shimming is possible if too low but now I have to break, round and smooth all the insert edges so that I do not marr any work I do on it!!! So much for buying a “quality” tool?? Thinking that the router table fence needs to be kept parallel to the miter slot is, IMO, a misunderstanding. Almost all coping sled designs guide along the fence, and the few that do ride the miter track register the fence to a surface on the sled base to get it parallel. All of the other types of sleds that ride the miter track that I’ve seen are intended for use without the fence (though you may keep it in proximity for DC). That said, for $1,000, I’d expect that set up to be immaculate, with and Incra fence to boot. You can get a very nice shaper for that type of money. I’m not a big fan of coping sleds, mostly because the bit has to sit up so high above the table top to offset the sled thickness. Having said that, I’m re-considering my opinion based on the comments above. Sometimes you get set in one way of thinking and don’t consider other options that are as good, or better. I’m still very disappointed in the Bench dog approach to the fence slots. They could have done so much better. Earl , I have the same bench dog cast iron table and heavy router lift , but I purchased the Baltic birch plywood cabinet instead of the steel one. My complaints are pretty much the same as yours though, the flimsy plastic inserts are a joke , and the fence is hard to set up accurately, other than that I’m happy with it. 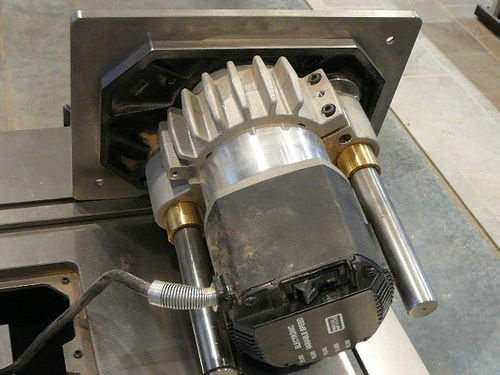 The heavy cast iron table is beautifuly machined flat , and the router lift is massive and well made. 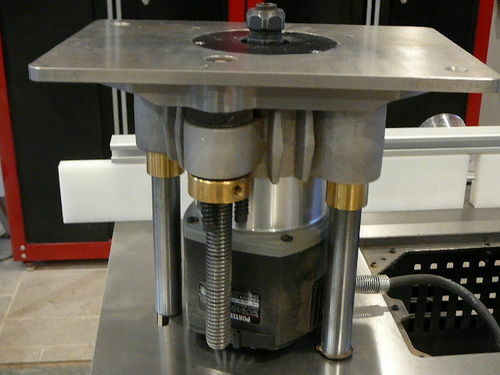 I considered this lift when I reworked my router table last year, but ended up going with the Incra Mast-R-Lift II which cost the same amount of money. 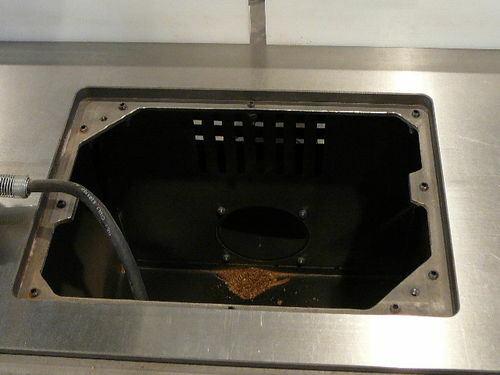 One of the main factors was that the Incra lift takes metal inserts (and the optional CleanSweep inserts to help with dust collection).